…..We were lucky enough to sample several treats this year at Tales of The Cocktail, and one of those was Spicebox Rye Whisky, a spiced whisky from our friends to the north. 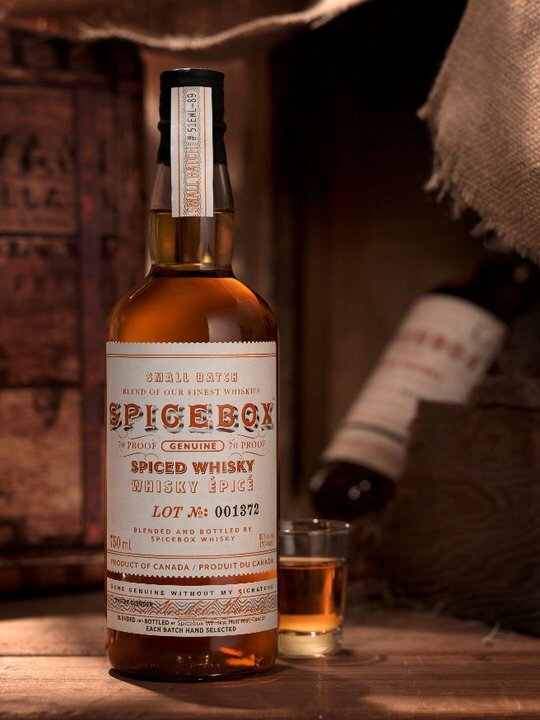 Spicebox is a blend of whiskies, aged for 3-6 years in bourbon barrels. Interestingly, they use a cold fusion technology to extract the pure flavors of spices and vanilla giving it a unique flavor and smoothness. They use a secret blend of spices ( their master distiller is good at keeping a secret), and a mixture of three different vanilla beans to create their final product. It’s first made in Alberta then brought to Quebec for further blending and finishing before being bottled making it truly Canadian. If you’re wondering where the name comes from, it actually originates from the prohibition days when smuggling whisky from Canada to the south was quite common, and often the whisky was hidden in boxes containing spices. Makes sense now right? First Impression: Very light in color, a pale amber to be exact. Nothing fancy in packaging, but these days its the flashiest that tend to fall short, so no worries there. The labeling kind of reminds me of those old “wanted” posters from the 1800’s- early 1920’s. Nice touch. Aroma: When we cracked this one open, I had to take a double take. It was as if I had just pulled the top off a tub of Breyers Vanilla Ice-cream. I expected this spiced whisky to have similarities to a spiced rum but the vanilla comes through on this amazingly, more like a vanilla rum. Taste: Well this isn’t one of those spirits where the aroma is deceiving from the taste. This one has a strong vanilla start which lingers into a vanilla finish. In between are subtle spicy notes, including sweetness from a brown sugar like taste. It’s got a bit of an after taste, but not a bad bite on this one that will make you run for a chaser. Tasted neat you can really appreciate the spices, but throw it on some ice and it gets even easier to drink. I like to see how things work outside of it’s element, so I actually poured a bit of this over some ice cream and the spicy sweetness came out beautifully. Although it is at 40% abv, it almost comes through like a lower proof liqueur, a good thing considering so many drinkers have harsh memories of their college days of rough tasting whisk(e)ys that left them in the bathroom most of the night. Not this one, smooth, and as Whisky Advocate put it, embarrassingly tasty. Overall: We liked this one. It was smoother than we expected for an 80 proof spirit, and it offered a better flavor combination of vanilla and spice than several spiced rums on the market. The spices tingle for a while on the tongue which is either an added bonus or annoyance depending on your taste buds but was no problem for us. A little bit of an after taste kept this one from getting a higher grade from us but don’t let that scare you, if it’s a B or better it’s a winner in our books. Great drink-ability, great mix-ability, and this one’s going to stay in our liquor cabinet. Photo and recipes courtesy of Spicebox whisky and mixologist Ali Tahsini. Spicebox is currently available in Colorado, Illinois, Kentucky, Ohio, Michigan and Indian through various package stores. For specific information on where to find them, visit Spiceboxwhisky.com. Combine ingredients and ice in a shaker and strain into a sugar rimmed glass. Top with ginger beer and garnish with a fresh mint sprig. In a mixing glass, combine all ingredients and add ice. Stir and strain into a small cocktail glass. Go to the duty free shop on any border crossing to Canada if you live close to one. I got mine from the Ambassador bridge in the heart of Detroit! It’s a smooth whisky with a lovely lingering taste of vanilla…… Enjoying it right now.